Yesterday, we got a first look at the U.S. and U.K. teaser posters for director Steven Spielberg's Peter Jackson–produced 3D motion-capture animation adaptation of Belgian artist Georges "Hergé" Remi's comic book series 'The Adventures of Tintin.' Today, we get the trailer. Aside from a few still images and the poster, Spielberg has kept 'Tintin' a mystery. But from the looks of things, the director's affinity for revolutionary special effects ('Close Encounters of the Third Kind,' 'Jurassic Park') has been put to good use here, with the motion-capture technology pioneered by Spielberg's real-life friend and 'Back to the Future' collaborator Robert Zemeckis looking sharper than ever. However, one secret remains: Where is the rest of the film's title? The full title had been 'The Adventures of Tintin: The Secret of the Unicorn,' however, the subtitle is absent from both the poster and the trailer. Jamie Bell, Andy Serkis and Daniel Craig star in the flick, which hits theaters Dec. 23. 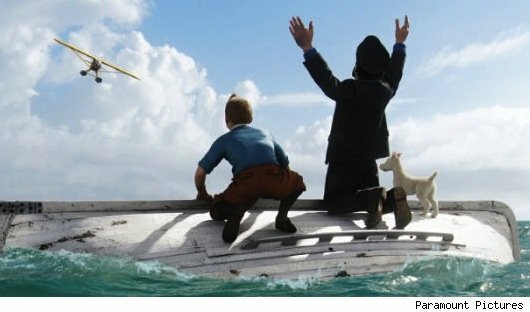 Check out 'The Adventures of Tintin' trailer after the jump.